New Jersey’s Elysee Productions has unearthed two tawdry, torrid treasures from the salt mines of sleazy drive-in cinema history: the complete and original scores for Al Adamson’s notorious monster-match Dracula vs. Frankenstein (1971) and Eddie Romero’s equally infamous tropical terror Mad Doctor of Blood Island (1969). The former was originally released by Adamson’s decadent drive-in distribution company Independent International Pictures. 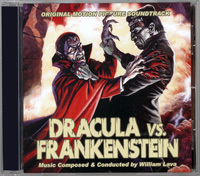 William Lava’s bombastic but suitably sinister score for Dracula vs Frankenstein includes a remix of the title track by producer Sam Sherman. 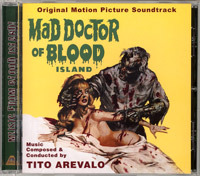 Tito Arevalo‘s sweaty score for the Filipino frightfest Mad Doctor of Blood Island, from Hemisphere Pictures, the centerpiece of Eddie Romero’s “Blood Island” trilogy about horrific experiments on a remote island (the bookends being Brides of Blood and Beast of Blood), is likewise deliriously over-dramatic but exotically effective. Both scores are eerily atmospheric and evocative in a lusciously lurid, low-budget vein. Both are limited to a pressing of 1,000 so if you’re a fan of grindhouse cinema, do not delay, order today! Tagged Dracula vs Frankenstein, Mad Doctor of Blood Island. Bookmark the permalink.